Think fast. You find yourself stranded in the Corte Inglés Gourmet Club, or sandwiched between stalls in Valencia’s Mercado Central. How do you navigate your way through these foreign food experiences? Turn to our handy cheat sheet. 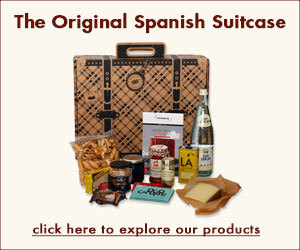 Here are the top five words you need to know when shopping for Spanish gourmet foods. 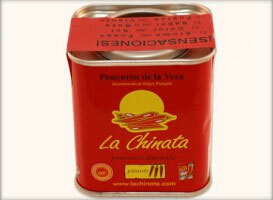 Simply put, conservas are preserved foods. Typically prepared with vinegar, olive oil or brine and stored in an airtight can or jar, conservas mature and become more flavorful over time. In Spain, you’ll find that most conservas are either seafood — like Bonito tuna and mussels– or vegetables — like piquillo peppers and white asparagus. Unlike in the US, where canned food is relegated to the back of your pantry for use during some type of apocalyptic emergency, Spain celebrates its canned food culture. 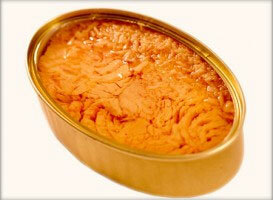 In fact, premier canned seafood and vegetables are considered luxury staples in Spanish homes, restaurants and tapas bars. Spain is renowned for its pimentón, or paprika. In the spice section of any good Spanish grocery, you’ll encounter three varieties of pimentón — dulce (mild and slightly sweet), agridulce (lightly spicy) and picante (very spicy). Made from ground Capsicum annuum, a family of peppers that encompasses bell and chili varieties, pimentón is a signature ingredient in Spanish stews, rices, seafood dishes, tortillas and sauces. While Spain is a leading producer of paprika, only two regions have been given certified designation of origin by the government — La Vera, internationally known for its intense, oak-smoked paprikas, and Murcia, recognized for its rich, aromatic and sun-dried paprika. Perhaps the most famous Spanish gourmet export, jamón– or dry-cured ham, is the pride of Spain. You can’t wander into any tapas bar, restaurant or grandma’s kitchen without smacking into a leg or platter of ham. 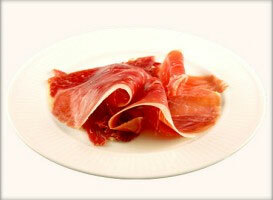 There are two types of Spanish ham — serrano and ibérico. Similar to Italian prosciutto, jamón serrano, or mountain ham, is produced from cereal-fed white pigs from the Sierra Mountains. The more rare, expensive jamón ibérico — whose arrival to the US was personally championed by Asturian chef José Andrés — is made from black-hoofed ibérico hogs, referred to as “pata negra.” This richly marbled, sweet and flavorful meat is aged for a longer period than its mountain cousin. While both jamon serrano and ibérico are highly prized, the ultimate Spanish pork product is jamón ibérico de bellota, made from acorn-fed ibérico pigs. Marconas are an exceptional variety of almonds only produced in Spain, along its Mediterranean coastline. 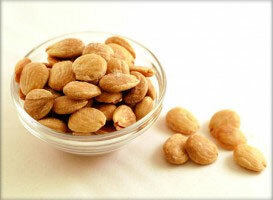 Known as “the Queen of Almonds,” these nuts are far larger and rounder than the well-known California almond, with a smooth surface and buttery, sweet finish. Typically blanched, roasted or fried, these almonds are a mainstay in Spanish snack culture and get regularly incorporated into Spanish sweets like turrones, or nougat brittle. One of the first foods that come to mind when someone says “Spain” is rice, or more specifically, paella. Bomba, a short grain rice harvested along the Valencian shoreline, is the preferred rice for preparing this dish and other arroces, or rice dishes. Bomba is unique in the way that it can absorb three times its volume in water or broth, as opposed to two times its volume like other rices. The grain expands into little “bombs” as it cooks, becoming more flavorful and never compromising its integrity. Bomba’s adaptability make it an ideal rice for meals that are slowly cooked, and exposed to changes throughout cooking — like being moved from a paella burner, to the oven. 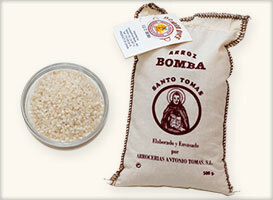 In 1986 Bomba received the first-ever Protected Denomination of Origin (PDO) for rice. Its DO status, star role in paella and low yield explain why it’s the most coveted — and expensive — grain in Spain. cereal and acorns, these hogs know how to live!